Our porch is 90 feet all around and we absolutely love it. 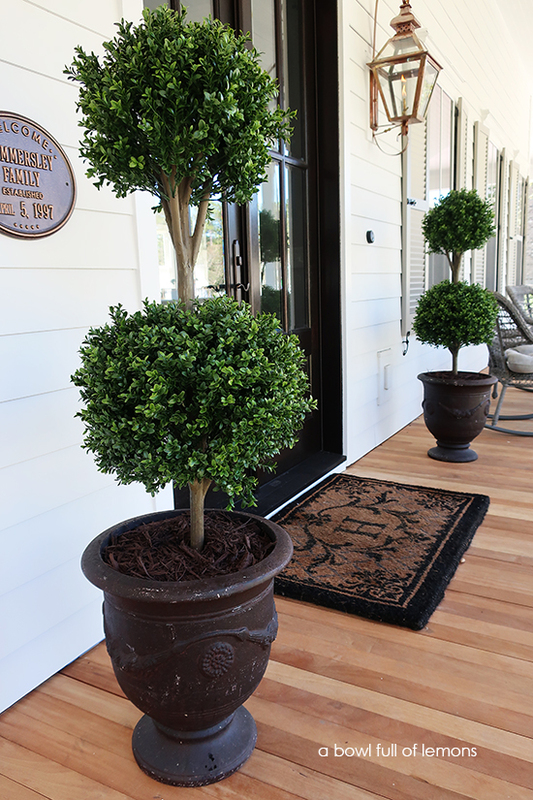 With a porch this large, we wanted to include statement pieces that would compliment the size of the space. 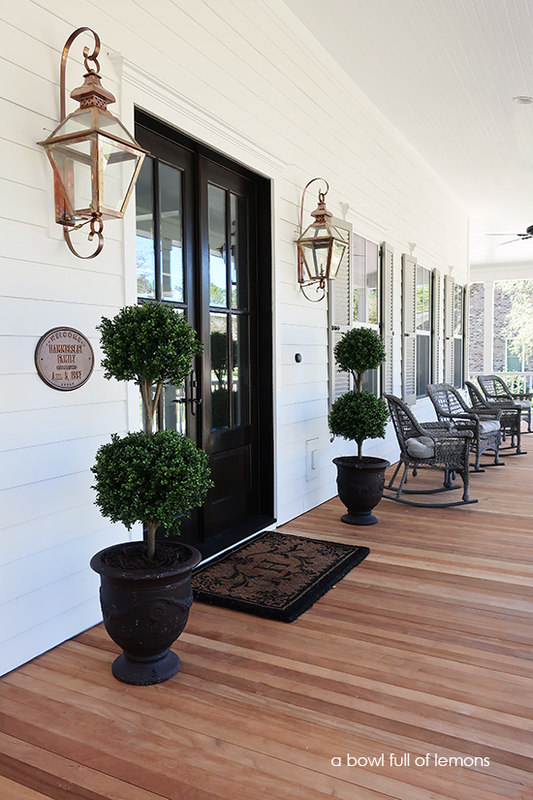 We also wanted it to blend with the charming southern surroundings, so we installed 24″ gas lanterns, operable composite shutters, and beautiful garapa decking. 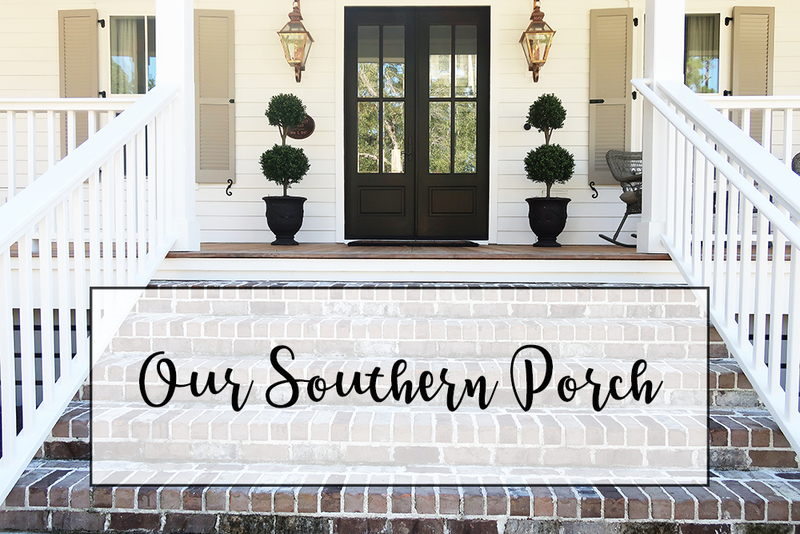 Keep reading to see how we made our porch more “southern”. 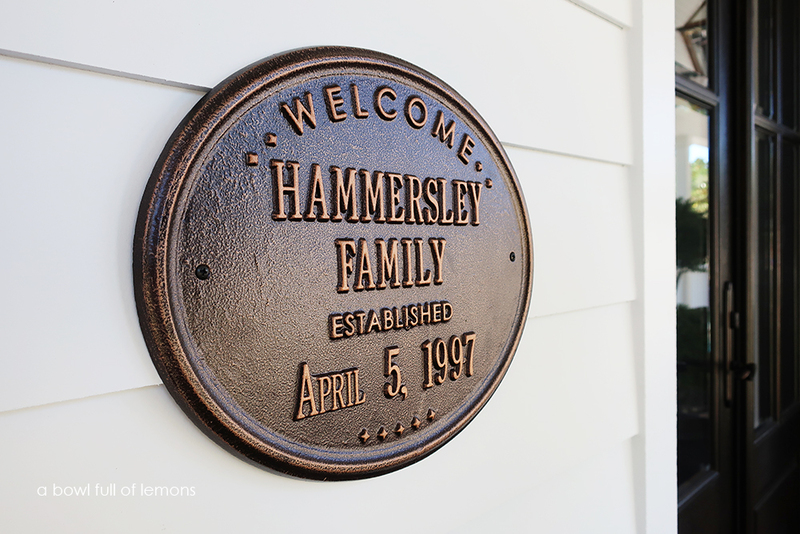 Every southern porch needs a family plaque. I found this beautiful plaque here. 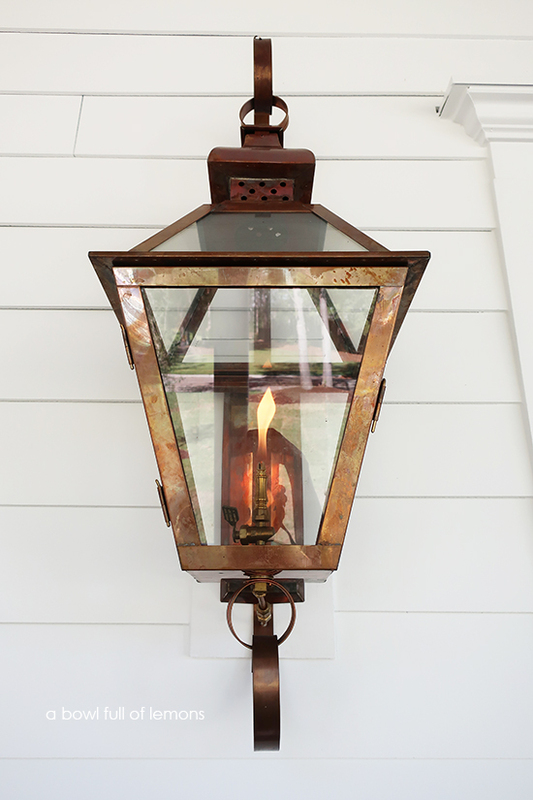 I chose antique copper to match our gas lanterns, but there are other options available. I have always had ferns on my front porch, but watering, feeding, and cleaning up the debris day in and day out was quite exhausting. After much discussion and research, we decided to go with faux topiary plants this time around. I can’t say enough about these gorgeous topiaries and I am thrilled with how they look. They add so much curb appeal to our home. To make them appear more “real” we added mulch to the container. We also added bricks to the container so they wouldn’t fall over from high winds. Faux plants have a bad name but they shouldn’t. If you choose a reputable company with good reviews, these plants can last you years and years. They are worth the initial investment. You can find these topiaries here. (I recently purchased the Allen & Roth planters at Lowes on clearance for $17.00 each). 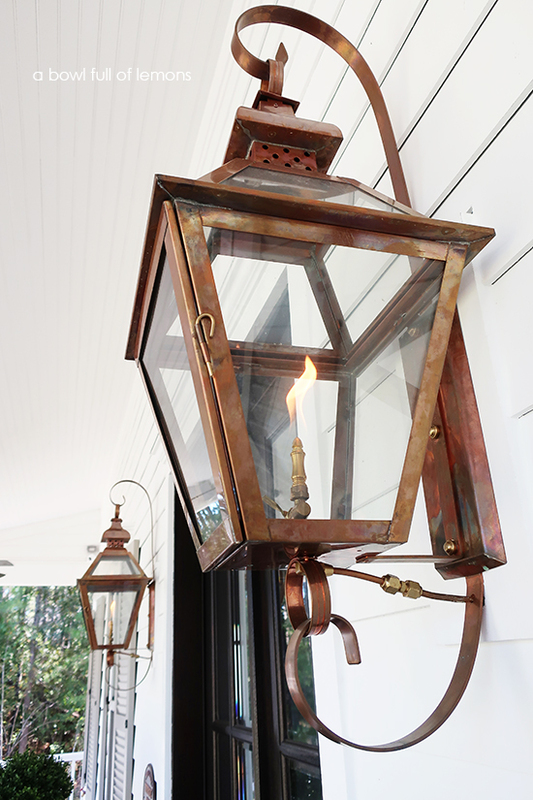 Another “must have” for a southern porch are copper gas lanterns. These are statement pieces for any home. You can find exquisite gas lanterns at the family owned Lantern & Scroll. 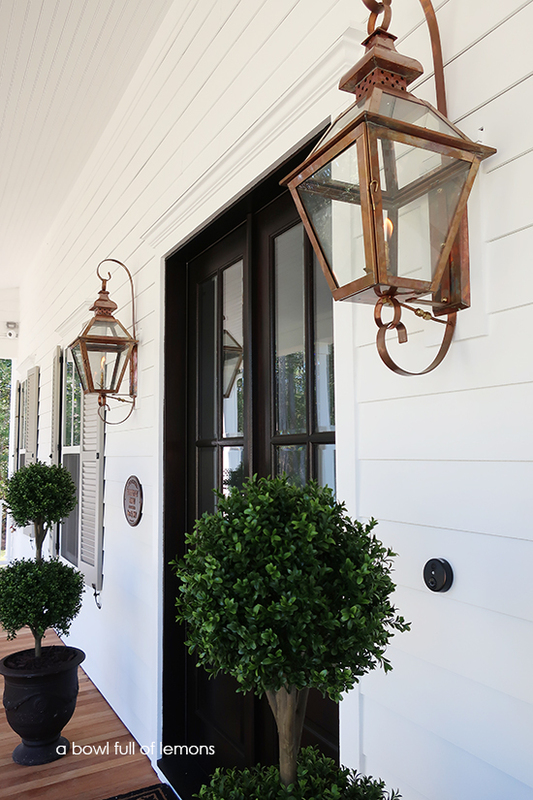 We chose the Tradd St. gas lanterns in solid copper. I absolutely LOVE them and we receive compliments all the time. We don’t notice too much of an increase on our gas bill but if that’s something you are concerned about, you could install electric lanterns instead of gas. Lantern & Scroll has so many gas and electric lanterns to choose from, so be sure to check out their website. If you look way down at the end of the porch, you will see we have a porch swing. I think every southern porch should have one. One of these days, we will hang it (hopefully before winter arrives). I found the wicker furniture here. The Details: Our exterior paint color is Sherwin Williams Snowbound. The shutters are Acier Gray. 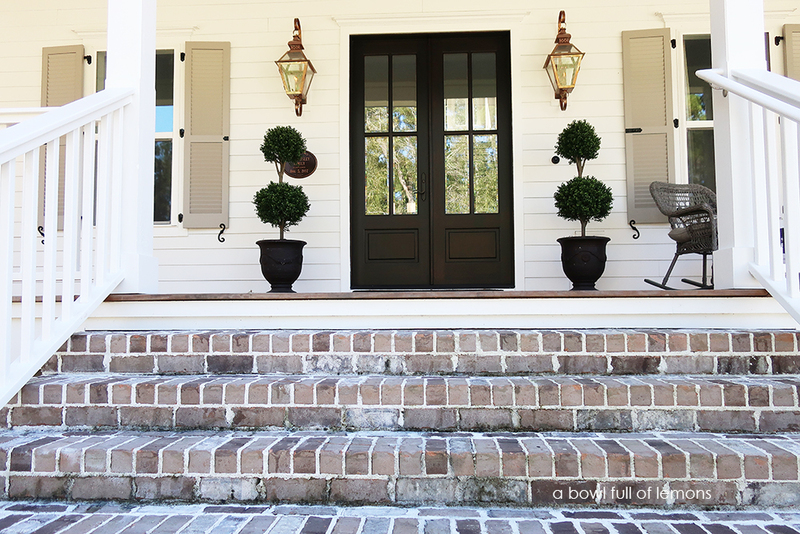 The door stain is espresso by Minwax and our porch flooring is Garapa wood (Brazilian hardwood). The brick is Mt. Rushmore Queen by Boral Bricks (with white mortar). 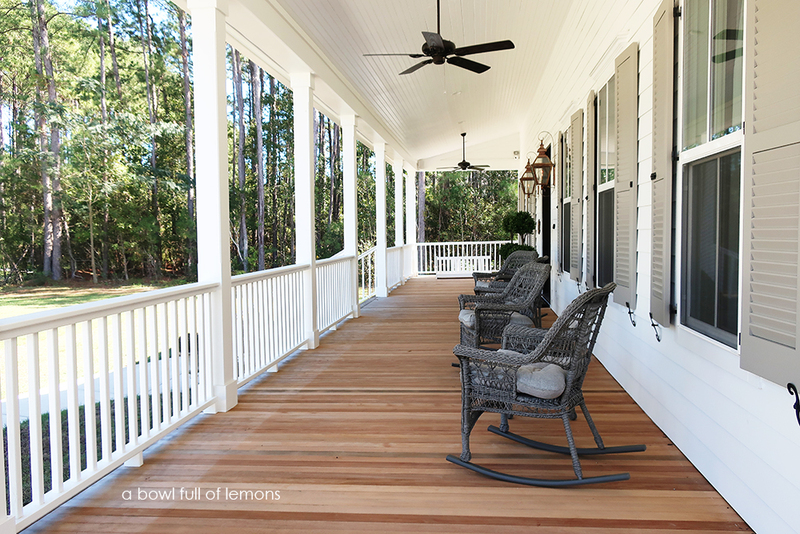 One of the reasons we chose the Southern Living Farmhouse Revival plan was because of this beautiful porch. It’s a dream come true and we are blessed and grateful each and every day to call it ours. 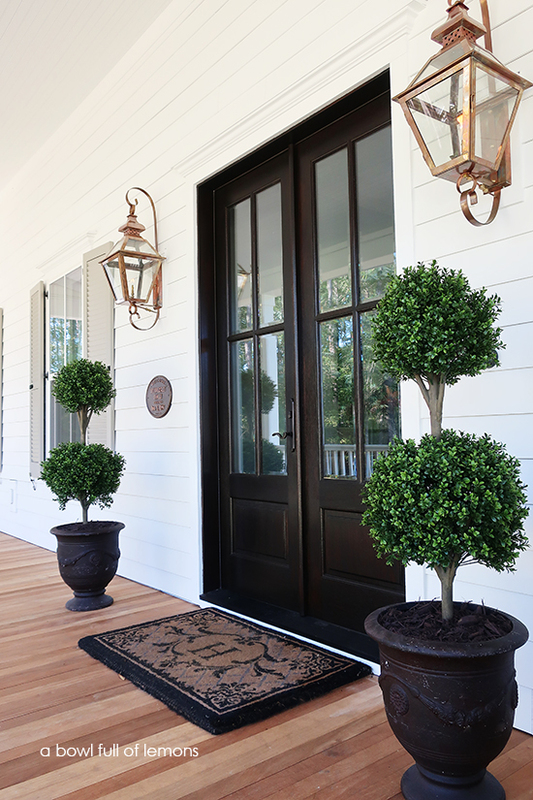 Thanks for taking time out of your day to see our southern porch. I am thankful for each and every one of you. If there is something you would like to see on the blog, please let me know! Have a great day.